Simon Says Add a Sentiment! Thank you for joining us for the Patterned Paper Challenge and we hope you will all join us again this week too. We are showcasing Clearly Besotted Products this week. You don’t have to use them to join in but if you have them we would love to see them used. I have been doing a lot of colouring lately. I am enjoying colouring. Doesn’t matter if it is copic colouring, watercolouring or pencil colouring. On my card for the challenge, I did some quick copic colouring. 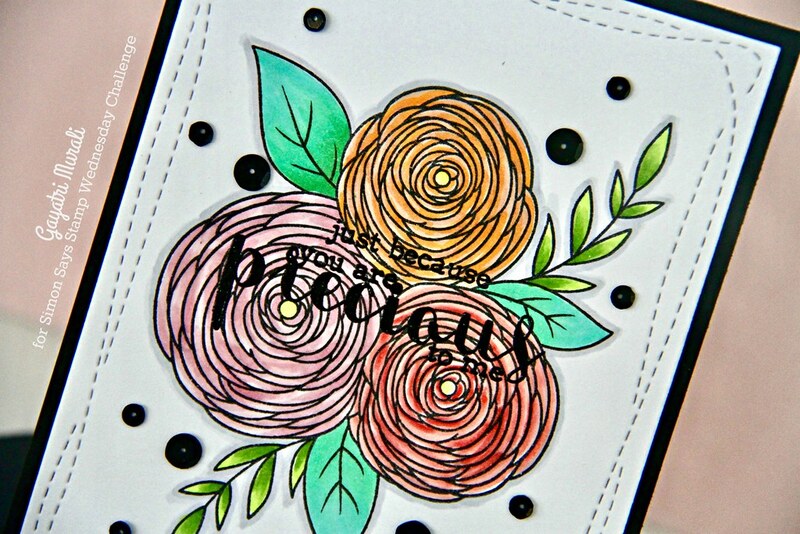 I stamped the image from Clearly Besotted Just for You stamp set on a white card stock panel. I used Simon’s Intense Black Ink to stamp the image. I coloured the image using copic markers. And outlined the image using copic cool gray pen for shadow effect. I then black heat embossed the sentiment over the stamped and coloured image. I die cut the panel using Simon’s Wonky stitched rectangle die and adhered the panel on black card base. I embellished the panel using black sequins. The black card base and black sequins picks the black from the sentiment and outline of the image and brings them all together. 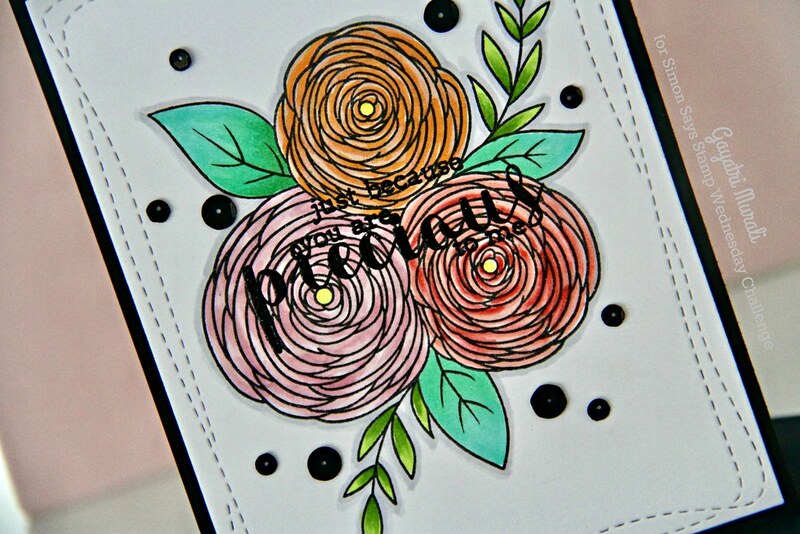 Here are some of the closeup of the card. I always like simple easy to make cards. The card turned out beautiful. I love it. It is now when I write my post, I felt like I should have added some tiny black spatter on the background. Anyhow, I still love this clean look. All the supplies used to make this card are listed below. If you like to bookmark my card to your Pinterest, here is the pin image. Thanks for coming by today. Cannot wait to see what your make for the challenge. 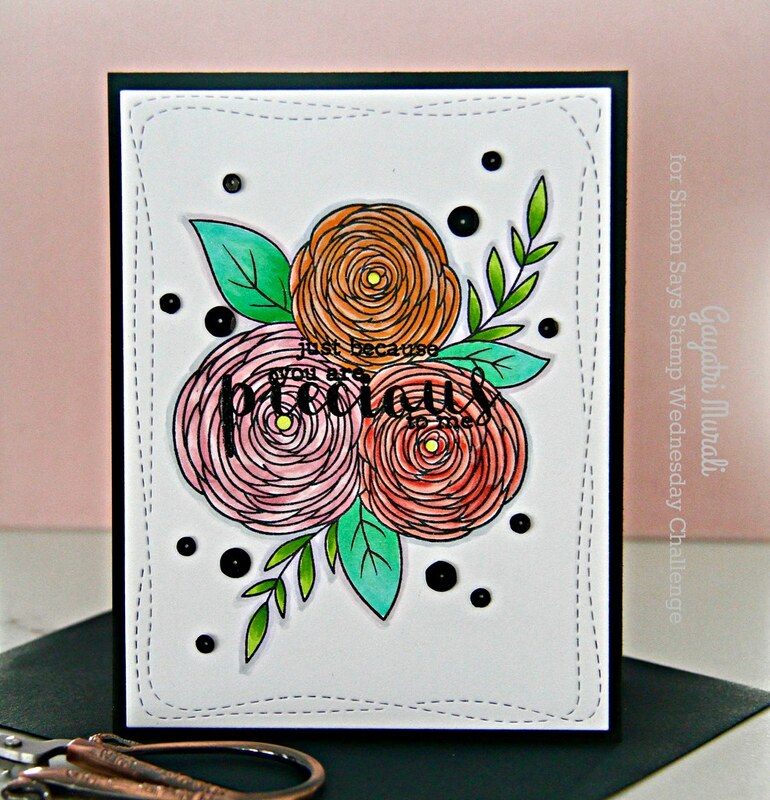 Pretty card Gayatri, love the stamping over your flowers.